As LGBT Pride approaches, Alice Saville asks why London's glut of queer theatre is looking to the past, not the future. Hir, Bush Theatre. Photo: Tristram Kenton. This month there’s a modest glut of LGBT theatre: marking both Pride and 50 years since the decriminalisation of male homosexual acts. But ironically for an industry that people cheerfully say is “run by gays”, the shows on offer don’t suggest that the theatre world is wildly clued up on LGBT+ or queer politics. Both the National Theatre and the Old Vic are dispatching their duties towards Pride season by staging a series of plays, called Queer Theatre and Queers respectively. Perfect, you might think. Queer is an inclusive umbrella term, a reclaimed insult which is now used to refer to all sexual and gender minority groups. Time to include lots of them. Um, nope. Mark Gatiss introduces Queers as “a marvellous opportunity to celebrate LGBT life and culture” – to which end, seven male writers and one heterosexual women are writing exclusively about gay men’s stories. The National Theatre is doing a little better: one play out of the six that appear in Queer Theatre is a story about women, by a woman. But that still leaves five that tell gay men’s stories. Across both collections, all writers but one are white. It’s not just a Pride season problem, either. Vauxhall venue Above The Stag describes itself as an LGBT theatre. But the rainbow flag on its logo is a pretty empty gesture towards diversity – beside a token fairy godmother at panto season, there’s no room for women in its line up. And its show for Pride season, He Shoots! He Scores! has a cast that look so alike they could have shared a womb. Quite recently, too. As well as being dominated and defined by white men’s stories, the glut of gay theatre is also overwhelmingly backward-looking. Alongside revivals of gay classics like Angels in America or The Boys in the Band, there are the new monologues about 20th century gay history in Queers, or more recent musicals like Miss Nightingale and Yank! The Musical that look back to ’40s Hollywood. Ideas of gayness are defined by a 20th century narrative of self-loathing, secrecy and persecution giving way to struggle and victory – ideas which have been endlessly chewed over, made digestible by mainstream culture. 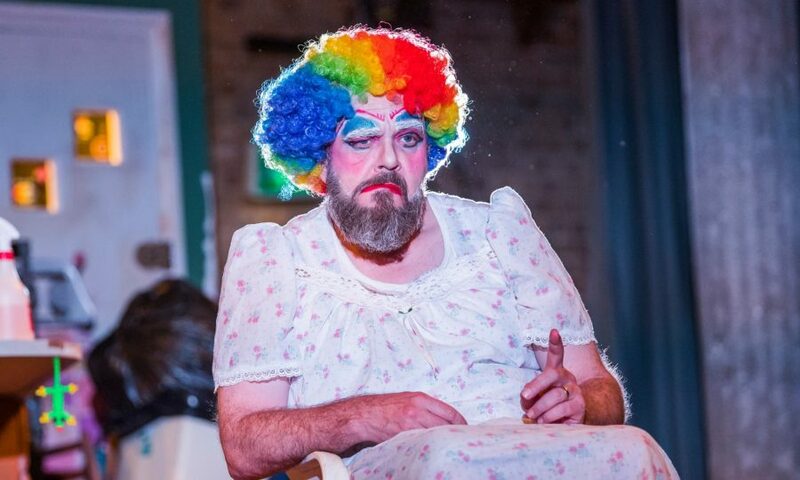 Gay theatre in Britain has an intriguing, storied history, stretching from Shakespearean cross-dressing to 18th century dandies to panto to camp cabaret, and it’s one that’s worth celebrating – as is the landmark decriminalisation of male homosexual acts. But just because homosexual acts in women were never banned, it doesn’t mean they didn’t carry huge social stigma and risk. Society has historically defined women entirely by their attractiveness to and relationships with men, creating a hugely pervasive invisibility around queer women. The old myth that they didn’t ban lesbianism because no one wanted to explain it to Queen Victoria has a truthful ring to it. Whether it’s straight, bi or gay, female sexuality is something that society’s still uneasy with, 100-odd years later. This year’s celebrations have largely left this more thoroughly hidden history out, along with the past two decades of queer thought: they don’t acknowledge the battle for acceptance of trans and variant gender identities, and the (admittedly modest) progress towards an intersectional understanding of race and queerness. These ideas are tough. They’re hard to sing. But they’re hugely important, because telling the same old stories about gay identity reinforces a narrative of cultural invisibility that hides the stories of queer women, people of colour, and trans people. There are plenty of complex reasons why stories about white gay men thrive in the West End, while others from the wider LGBT spectrum don’t. Perhaps gay men appeal to the mainstream in a way that, say, butch women don’t. Perhaps groups that aren’t white gay men have less disposable cash to spend on theatre. Perhaps the stories of queer people of colour are a minority within a minority, seen as ‘issues’ not entertainment. Or perhaps it goes back to the writers: it could be that people who already tick one minority box are reluctant to pigeonhole themselves further by writing about their sexuality/gender? I’m going to stop speculating now, because the simplest reason I can think of is that there’s a legacy of sexism and racial inequality, structural and implicit, that makes it much easier for white male playwrights to thrive, and to write openly about their sexuality. Jon Brittain has used his visibility within the gay theatre scene to direct attention to queer women and trans stories – and he does so brilliantly in Rotterdam. It’s a magnificent anomaly: a sensitive, hilarious glimpse into a relationship that evolves as one partner comes out as trans. Rotterdam at the Trafalgar Studios. Photo: Piers Foley Photography. Taylor Mac also uses a platform built through groundbreaking cabaret performances to tell new stories: less successfully so. Hir should be a beacon of new thinking. But weirdly, it feels like a vision of queerness that’s seen through straight eyes. Its main character is a straight man who vomits whenever anything particularly queer happens, and his revulsion taints the utopian ideas that Mac’s script bandies about, or turns them into polysyllabic punchlines. It’s a play that anyone even slightly homophobic could go into and laugh, painlessly, throughout, their prejudices confirmed. It’s a play that makes queerness complex, burdensome, and dangerous to an average family which it imagines don’t have the emotional resources to grapple with it. They do, of course. But Hir’s lack of faith in the goodness, the expansiveness of its characters mirrors a wider lack of faith on the part of the theatre industry in audiences’ abilities to handle queer stories that don’t fit the buff white boy-on-boy mould. These stories are left to the slimmest margins of the theatre world, and even when they are successful they don’t get the afterlives they deserve: Mojisola Adebayo’s Mohammed Ali and Me ran in local boxing rings, not the Bush Theatre, Lucy J Skilbeck’s rare feat of drag king history Joan had a short run at Ovalhouse, not a high-profile transfer. Camden People’s Theatre is running Come As You Are season of queer experimental performances, too, where a fascinating array of new works will get an airing. But without the muscle of a Mark Gatiss behind them, they won’t reach more than a few hundred people: and unlike Queers, they definitely won’t get on the BBC anytime soon. Debates on gender, on who we love and how we love them, are some of the most interesting conversations happening right now. The joys of Tumblr (and social media more generally) mean that ideas of queerness, intersectionality, and gender fluidity are becoming second nature to younger people, while older generations are left behind. Theatre could and should be a place to explore them. And its gatekeepers could do so much more: by taking risks, actively looking for new stories, and by only using the term LGBTQ if they’re going to explore more than one letter of it. Because right now, it feels like the theatre industry is only interested in queer stories when they’re calcified, couched in familiar language and legitimised by the warm glow of retrospective tolerance. As the furore over Pride’s hugely tone-deaf posters shows, there’s an appetite for new narratives: ones that don’t centre straight audience’s comfort. Let’s start telling them.